Why Fly Remote Controlled Airplanes When You Can Fly a Fly? MIT Technology Review has an interesting article on Army research to remotely control a beetle's flight path via a neural microchip implant. Don't believe me? Check the video. Its fascinating! 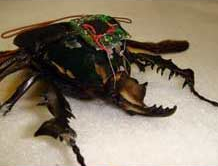 "The beetle's payload consists of an off-the-shelf microprocessor, a radio receiver, and a battery attached to a custom-printed circuit board, along with six electrodes implanted into the animals' optic lobes and flight muscles. Flight commands are wirelessly sent to the beetle via a radio-frequency transmitter that's controlled by a nearby laptop. Oscillating electrical pulses delivered to the beetle's optic lobes trigger takeoff, while a single short pulse ceases flight. Signals sent to the left or right basilar flight muscles make the animal turn right or left, respectively." Hat tip to mocost via Twitter. At The Open Source Paleontologist I noticed his recent posting Welcome, Longhorns. I have never been a big school spirit rah rah rah type, but having lived in Texas as a kid I have always loved UT and it was where I was going to go when I first got out of the Army. So naturally I followed the link to the class and found myself eventually at the site Digimorph.org. If you're not familiar with it (I wasn't) Digimorph is an NSF funded project at UT that is part of the digital libraries initiative. It has an amazing collection of digital morphology studies created using CT scans. They have over a terrabyte of data covering living and extinct species of interest to active research and eduction. Most of the focus for the project in the past was on vertebrate species, but they are adding more and more invertebrates now. The data is available online as Quicktime movies and still images and a very cool java applet that lets you pick the slice you want to view. 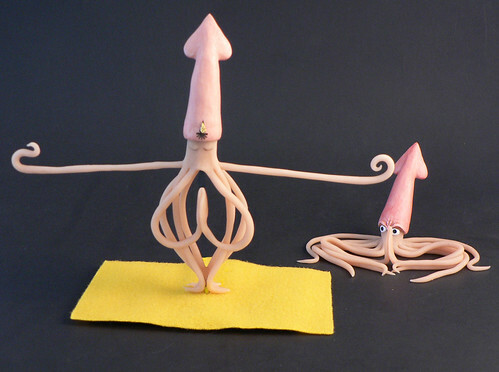 I really love this site as it combines so many of my past things together: 3D (including 3D printing and animation), visualization, computers and biology. Guess who just found a new timesink! Gotta get some invertebrates into the most popular. These two links are from Southern Fried Scientist, a graduate student from the lab Kevin works in at Duke, who has splashed into science blogging with both feet. 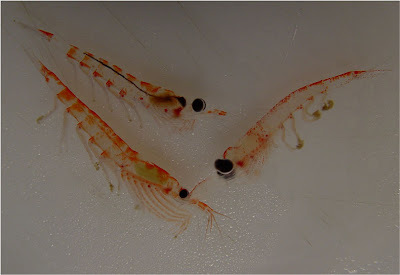 Also connected to his TA'ing activities is an awesome series of posts featuring short video productions, by the students in the class: Topics in Marine Invertebrate Zoology. It's a fascinating story at the BBC with a video of the act! DSN recently posted Ocean Tattoos from the illustrious Love Lab at UCSC UCSB. Of course mindful of the historic Invertebrate Wars and the recent artful attempts by pro-echinoderm agents to renew the conflicts, I thought maybe a survey of science tattoo subjects could be used as a proxy to head it off. For the invertebrate war phyla, I was surprised that both echinoderms and molluscs are so under-represented in the gallery. I may have to get a tat for graduation, and another when I get a masters. Hmmm... who belongs to this winning one? From the twitter traffic and initial reports posted I missed a great conference with co-blogger Kevin and a whole host of your online science favorites. Next year I've got to make it to this one! In the mean time I'm hoping or some more details to emerge as I dive into the coverage! 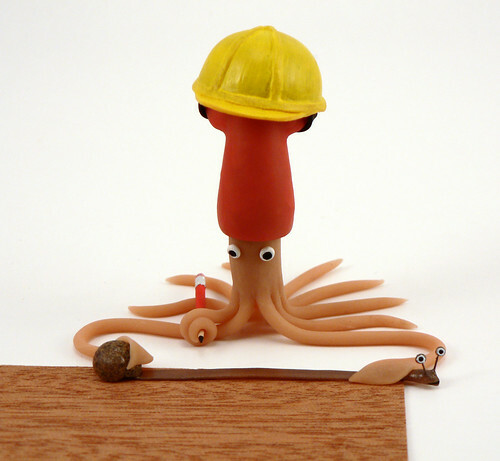 Forget blogging for dollars, the spineless are going Blogging for Darwin! Here (and at Kevin's deep sea haunt DSN, in their shiny, new, untethered diggs) we're going to participate in the Darwin Celebrations in a variety of ways, including by Blogging for Darwin... Be sure to tune into both blogs (you do anyways right?) 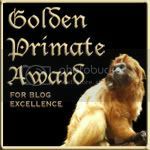 and check out all the other participants who are conveniently listed at the Blogging for Darwin page. After the celebratory week is over well all be nursing our hangover...er I mean... all the best Darwin blog postings will be gathered together at BlogForDarwin.com. Already that site is full of Darwin goodies all collected together for your convenience. 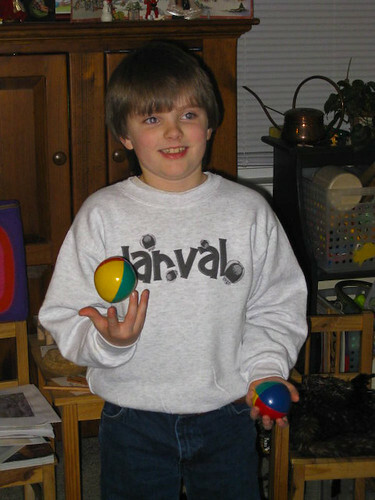 My son Johann enjoying some juggling practice with his new juggling balls and wearing an awesome sweatshirt from Kate at the Radula. She has them available at her Cafe Press store along with a number of other great invertebrate and science based designs. Bigelow Laboratory for Ocean Sciences is looking for a good biogeochemist (or plankton physiologist) for an 18 month post doc position studying iron storage in marine phytoplankton. How cool is that? Ocean field sampling plus playing with a synchrotron. You know the process... CV, letter of interest and contact info for three references to jobs at bigelow dot org with the reference #PD09-3 in the subject. 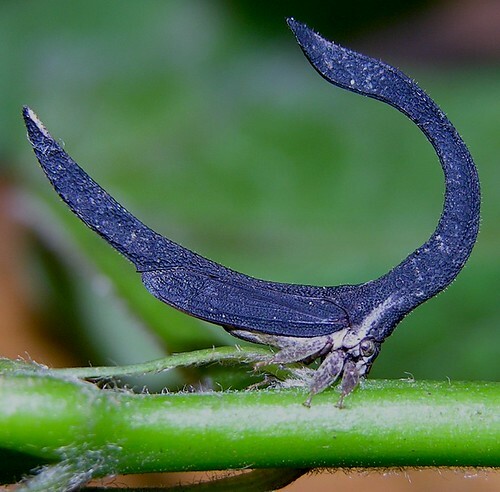 One of the oddest treehoppers, Sphongophorus (Cladonota) ballista, from Panama, originally uploaded by artour_a. Cruising through a few of the recent images uploaded by Artour_a at Flickr and I ran into this beautiful treehopper. I remember some real oddities when I was in Honduras, but this one is a real winner! I was down at our local toy store (the totally awesome Mystical Toys) when I spotted an interesting auio CD aimed at kids: The Hipwaders – Educated Kid . The track list includes "Educated Kid", "Dewey Decimal System" and the two that made me buy it on an impulse (a big deal considering student finances!) – "Song of the Paleo Pirates" and "Cat in a Bathysphere"
At least for many larger predator species in Antarctica. I don't know maybe a half a plateful of these with some pasta? Maybe the folks on board the R/V Gould (currently headed to the new research season in Antarctica) have a recipe? Of course the question is...how many species (and what species) are in the picture, and which one tastes best? 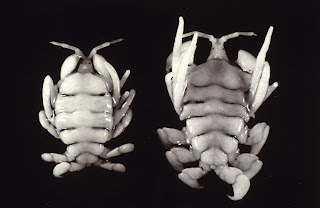 Portuguese fisheries biologists have made a rare sighting of the endangered amphipod, the Right Whale Lice. The lice, and their host, were spotted off the coast of the Azores according to the report from the New England Aquarium's Jeff Ives and Aquarium whale researcher Philip Hamilton. Phillip has the complete story along with pictures and map of the sighting and positive ID of the host (last seen in Gulf of Maine just a few months ago!). 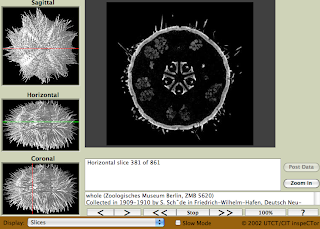 For some reason though they seem to focus on the host organism, rather than the awesome whale lice. You might notice I've had some quotes up there under the ole banner for quite some time. Me thinks it's time for some new ones. Although I really like the Huxley quote, that might stay. Anyone have any favorite spineless quotations? Enter them into the comments! A good flag is important! That is why I recommend this one I made for International Talk Like a Pirate Day. Hat tip Michael Barton, FCD. I lived in Monterey, CA and the Monarchs would make a stopover in the area. It was quite amazing to see them cover the trees in Pacific Grove! Their larvae ate the milkweed of that grew wild all over the hills of California. 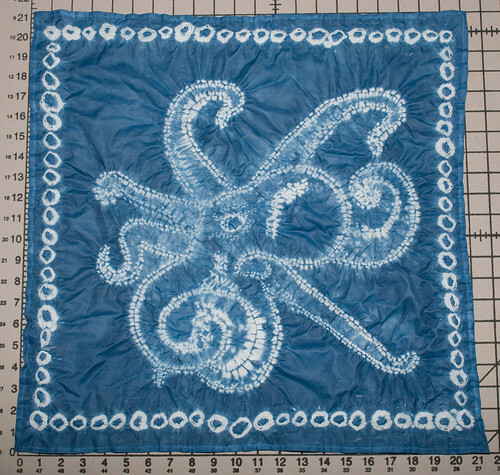 Cephalopod shibori, originally uploaded by eclectic echoes. May your new year be invert-tastic!